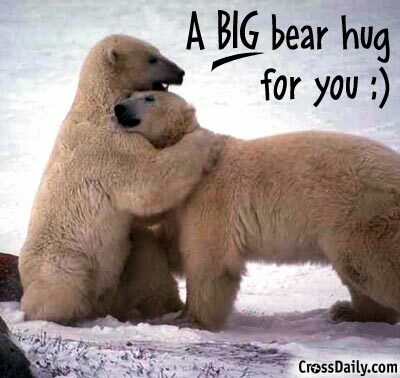 Hugs to the hugging Queen!!! I am sorry to hear about your uncle. Wow it has been a really long time since I updated this thread so I have a lot to tell you. Lets see where to start....Well it looks like I left off after Halloween last year so I will try to pick up from there. My fathers health continued to get worse and my sister, the one he was living with, took very good care of him. In late October she went to help my brothers wife and daughter, they live in Louisiana, so she was gone from home for almost a month. I went over everyday and helped my dad and took care of the animals you know regular stuff. (My dad had not gotten to bad by this point he just needed help with a few things, you know making sure he ate and took his medication) One day I went over and he was not well at all, very pale and couldn't eat or get out of bed. I called my work, I was on lunch break, and took him immediately to the emergency room. Once there we waited in the ER for about an hour but finally they got him back and in a bed. They began their stuff and I waited and explained my concern. After another hour or two the doctor came in and said my father was bleeding internally and his blood count had dropped down to 5. Normal is around 13, 14 so they wanted to do a blood transfusion which he refused based on his religious beliefs. When the doctor left the room he was angry and pretty much told my dad he was going to die unless he took the blood transfusion. I was upset because of the way the doctor spoke to my father so I asked daddy, "Are you sure you do not want to take the blood transfusion? If so, I will make sure your wishes are upheld but you have to be sure." He said, "I'm sure." I left his room to find the doctor and needless to say I let the doctor have it and told him that if he spoke to my father in such a way again he and I would have a big problem. He apologized and explained the medical ramafication of my dads decision. I next told him of some blood builders and volumizers that they could try and also ask that he be given a shot of EPO. The doctor agreed and I went back to my dads room and we waited for him to be admitted upstairs into a regular hospital room. I called my brother, he worked in a town about a half hour away, and told him he needed to come. The doctors changed shifts before my brother arrived but he reiterated my comments to the new doctor and finally we went upstairs to the room my dad would be in for the next week or so. I called my sister and let her know what was going on and she came home from her trip early. We, my brother, sister and I, let all the family know that my dad had taken a turn for the worse and then we waited to see what would happen. They did some test and found where the bleeder was and repaired it. His blood count began to rise but his heart was shutting down even more. His heart was now at 10% and his organs, especially his kidneys, were beginning to shut down, very slowly. He came home but with home hospice. My sister would not believe that he was dying, she preferred to think that he would get better and for a while he improved. By improved I mean he was able to get out of bed and sit at the table for his meals, he was able to get a shower, with assistance. The home hospice people were wonderful. His nurse and care taker came several times a week and helped my sister plus I would go over and help as much as possible. All of this happened in October/November. December began with a bang. My dad began to jerk and was not coherant. It was a slow happening, not noticeable at first until he finally wasn't able to sleep at all and was in constant motion/jerking and not making any sense at all. We called hospice and they told us to call the ambulance and have him admitted into the hospital. We did and found out that his kidneys were not working very much so he was toxic in his blood which was causing a sort of diminsa and the jerking was a result as well. They began infusing him with the saline he needed in the hopes that it would flush out the toxins. It did. After a couple of days in the hospital he was returned home. He had signed a DNR so there was nothing more they could do for him. After that incident he was never the same. He was much weaker and couldn't do much for himself anymore. All of that happened in December and January. I moved in to help my sister with him at the end of January. She was not resting at all and he wasn't resting much either. We had to start putting the rails on his hospital bed up because he would try to get up by himself and well he was not able to so he was hurting himself. He, at this point, is not able to use the bathroom he had to use a potty chair. We, my sister and I, helped him. The nurses still came and bathed him but his strength was gone. He used depends at the end of things. It became to much for him to get up and down to the potty chair. February was the hardest month I have ever had in my life. My dad rapidly declined. He was unable to eat or take his medications. We were giving him those drinks with all the vitamins and praying that it was enough. He wasn't hungry so we had to play games with him about drinking his meals. Finally the second week of February the Hospice people gave us a booklet to read about the end stages of life. We read it and realized that he was in the final stages. Even though we knew it was coming we were in shock. We began taking steps to prepare for the end. My brother had since moved to a place about 8 hours away so we called him and let him know that daddy was close and if he wanted to see him while he could speak and know that he was with us he needed to come now. We made videos of him talking to some of the family that was to far to come see him and we spent time with him. They had told us that he was most likely waiting for my brother to get here, and for us to let him know it was okay, for us to say goodbye. We each took a turn in talking to him privately, saying things we knew he needed to hear as well as things we needed to say. He understood and would nod or squeeze our hands. The night he died...We were all with him, me and my sister had not slept in two days. It was about 1 in the morning and one last person had gotten to the house. My sister told him that he was there and my dad smiled and grunted. It was amazing. I was sitting at his bedside and my sister was making coffee and I was talking to daddy and humming his favorite song to him. I had noticed before that that his eyes were fixed and dilated. He was breathing through his mouth very shallow breaths. At 2:30 my sister was making coffee and I was still holding his hand and humming to him and I saw him take his last breath. I waited for another but it did not come. I said aloud and shakily, "Hes not breathing anymore." My sister said, "Are you sure?" He had been taking longer and longer between breaths so she thought maybe it was that, but I told her to call Hospice. She ran over and we all were crying. She called Hospice. We waited until they arrived, all crying but not hysterical. The nurse pronounced him dead and began the process. February 15th at 2:30am my father died. I saw a lot of things over the course of the next week, I will not go into all of that here. We had my father cremated as were his wishes and had a private ceremony. His ashes were buried with my mother, at her grave, and whoever wanted to say something did. I took my time in deciding what to say but I got through it. His birthday was March 2 and I was sad that he did not make it to his birthday. The day my dad died one of the family dogs had a stroke and had to be put to sleep. Another of the family dogs began having seizures and soon after had to be put to sleep. In my mind I began wondering if it was me? Did I curse the people I loved and the animals in someway? I moved in the end of January and all this death followed me. I understand that is not true but the thought still lingers in my mind. Now in the midst of all of this I becamed disabled, again. Unable to work. My personal hell had begun back in October and it didn't seem to be relenting. I was able to draw a disability check from the government right away so at least that was one good thing but if any of you have ever tried to live on what the government gives you you will understand that is just not enough. I have medicare which I am thankful for. Don't feel sorry for me at this point there are some good things too, I just haven't gotten there yet. Now for the good. I am in love with the most wonderful man. A man a met here at E. He is wonderful and we complete each other I think. He lives far far away but we have been taking our time making sure this is real and not just a fancy. We have known each other for a long time, almost since I joined E. We were not romantic at first just friends. He shared in some of my life and I in his as friends do. Things changed after a relationship I was in did not work out. His relationship ended as well and so we began dating in a way. Becoming more romantic and decided we would try. I do not like long distance relationship, the one I was ending was one and it had hurt my heart so much that I wasn't sure if this was a good idea but we both decided that we would try. We have spent almost every hour of every day together since. As much time as possible. He knows my faults and I know his. Now we use Skype and spend hours with each other. It isn't the same as having that touch or hug but it is better than nothing. I am planning a trip to him since last year he came here. I hope to move to where he is eventually. There is a lot of paperwork to be done but he is my fate/destiny and nothing can stop the freight train now. He has been my comfort, my joy, my love, my friend and he has never waivered. It is something I am having trouble understanding since I don't think I have ever had this before. I guess in the midst of all of these terrible events he has been there, the one shining light, the hope of the future. I don't hope very often, I figure if I don't hope I will not get disappointed, but where he is concerned I am willing to hope. Life has not been the same since we have met. He knows more about me than anyone in the world, including my family. The funny thing is he accepts me for who and what I am, never judging always encouraging. In my mind that is what a twin flame is. I have soul connections with many of my friends but the connection of TF is something altogether different. I can't explain it but I know some of you know exactly what I am talking about. I have to thank E for not only being the great community it is but for opening my eyes to a lot of possibilites I would have never found if it hadn't been for this place. Now I guess everything is caught up. This post is soooo long, I hate writing long post like this because I feel like whoever reads it is probably going to get bored after the first couple of paragraphs. But the whole reason I started this blog was to write down things in my life which allows me to accept them. Writing is a gift for me. As I see the words I am able to feel the feelings go into the little boxes in my mind, so they are safely stored but not hindering me in my pursuit of happiness. There are so many other things that have happened over the course of the last few months but this is the main things. Thank you all for allowing me to write and for reading my ramblings. I hope you are happy and healthy and enjoying love in your lives. At first, when I read your post, I was speechless. I knew things were not going well and I must say I included you in my prays several times. However, I had no idea the situation had deteriorated so badly. I am really sorry to hear all those bad things struck you at once. Unless you are a kid, the likelihood of having experieced bad things is very large - even so, they tend to spread all over time. Some years ago, I went through a similar bad time, a kind of as astral hell when I thought everything would go from bad to worse. I really got sad and down, but as time passed, the world did not collapse. I know it is hard to come out with wise words for you in times like the one your are experiencing, Xandi. I just want to share there is always light in the end of the tunnel. Hugs to the Hug Queen, because a hug can fix EVERYTHING. Thank you for your kind words TL. As always you are a great friend with the words that comfort the comfortless. Hugs back because your right.....Hugs do fix everything. If you agree with me, I think it is time to fix your motto, Xandi! Visit my double A page for updates.